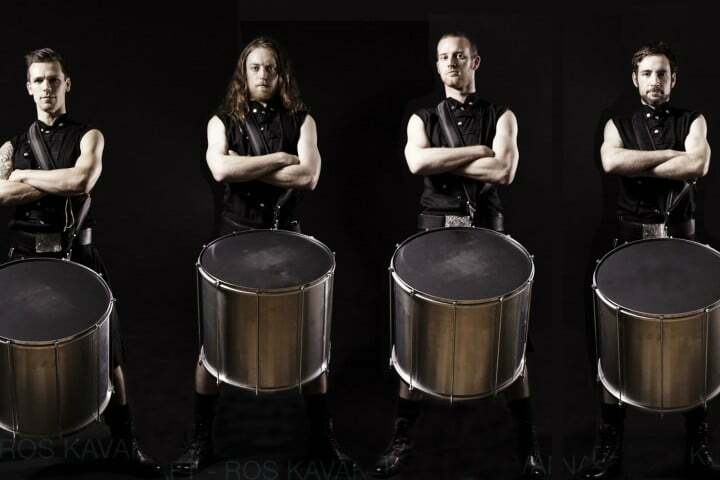 The Hit Machine Drummers are a brotherhood of rhythmic warriors, their live show is designed to enthrall and entertain with dynamic captivating drumming. They are Ireland’s top rhythm based entertainment who create each show from the ground up tailored to your vision. Powerful choreographed performances fused with elements of Irish dancing, filled with audience participation is sure to captivate any crowd and add excitement to your drinks reception. The drummers themselves are clad in authentic kilts, boots and military style vests. A commanding look that drives home and captures the passion of the show itself. The pulse of life, the rhythm of a heartbeat. A thundering gong. The beat of a well tuned drum. Rhythm is an instinct that pulls on everyone. It’s unavoidable! It’s a beautiful thing that grabs you on an unconscious level. A 15 minute charged spectacle crafted to leave jaws on the floor. We blast our way through a variety of pieces containing phenomenal choreography, blistering speeds, dynamic breathtaking Irish dancing with Celtic, Brazilian and African influenced drumming styles AND a healthy dose of audience participation. Guaranteed to leave you wowed and wanting more. Want to make sure your wedding entertainment never falters? As we are primarily acoustic, we have no need for elaborate stage set ups. Whether your band is setting up or taking a break, we can fill the interval with exciting set pieces. In need of ushering people from one event to the next? Why not have a platoon of blistering drummers lead the way! A dynamic and exciting way to link events and a sure fired way to make sure the pace never lets up. Having 6 Celtic warriors set up in the middle of your dance floor and start playing is one definite way to amaze and captivate your clientèle with something unique and unforgettable. Certain to get everyone pumped up and ready to dance the night away! Why not add to the already building tension of an award ceremony with a drumming chrous. Rising the tension to maxium levels before the big reveal! Let us open your sporting event or provide half-time entertainment, our passion is sure to drive the crowd to feverish levels! We are more than happy to collaborate with any other performers you may have hired on the night. For example, we often work alongside Celtic Rhythm Irish Dancers, providing the music for their routines. A highlight of such a show being a percussive battle between drummers and dancers. Other forms of entertainment can be folded into our performances with some coordination, be it fire breathers or jugglers, we can create something spectacular and unique. We can also provide extra percussion elements with DJ’s or live bands, adding to the elation of live music!